My belly dance troupe does a lot of performances for nursing homes and we always take a little something to give to the residents. We are dancing at a local home at the end of the month so we decided to give them a little Easter basket with candy in it. I've made 52 of them!! Here are a couple of my favorites. They don't have their candy in them yet because I can't be trusted with Easter candy in the house. Those little chocolate eggs call my name and I answer! Anyone else have that problem? I used my envelope punch board to make these and started off with the basic tutorial from Diane Dimich. Check out her video on YouTube: http://www.youtube.com/watch?v=kXn077wPKDw. She does the best tutorials so I would suggest looking at some of her other videos as well. 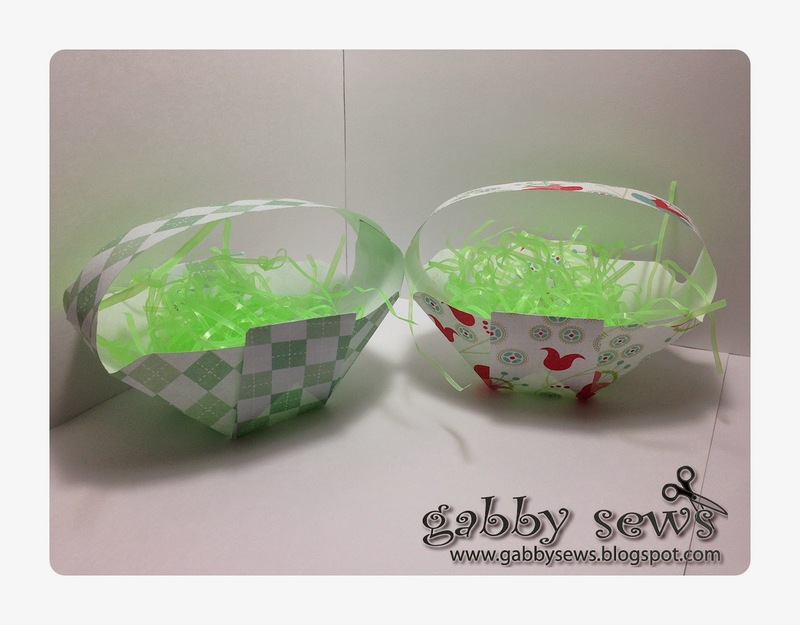 I needed to produce a smaller basket so I cut my paper down to 6" x 6" (you can get four baskets out of one sheet of scrapbook paper or you can use paper from a 6X6 pad and you are all ready to go!). I did all of my punching and scoring at 1 1/2". That also means that when you flip the paper over to make the additional punches necessary that you don't have to score again. That was a nice little surprise! I used paper from an old DCWV Super Value Stack called Summer Dreams. I have no idea if you can get it anymore but if you can, I would recommend picking up a stack. There are 180 sheets and I've gotten tons of use out of it. I have about 30 or so sheets left. I cut my handles at 1" wide by 6" long and used some Aleene's Quick Dry Glue to put them all together. I think they turned out really cute and were really easy to construct. I don't think I've used my envelope punch board to actually make envelopes yet! I'm very impressed at all the things you can do with it besides make envelopes. I picked mine up at Hobby Lobby with a coupon so it was probably less than $10. I think I got my money's worth on this tool!